BetOnline.ag is a popular online sportsbook that offers a wide range of sports wagering opportunities. The sportsbook offers a full-featured mobile website that supports nearly any device with a web browser. The mobile site is fairly sophisticated in that it will automatically detect your device and then provide you with a version of the site tailored to it. For instance, if you access BetOnline.ag from a tablet rather than a smartphone, the site will indicate tablet and adjust to make better use of the extra screen real estate. BetOnline.ag gladly accepts players from the USA. BetOnline offers all new members a 25% match bonus on your initial deposit worth as much as $1,000 in free bets, which is quite impressive for an online sportsbook. This promotion is only available to accounts that have not yet made a deposit. The BetOnline bonus applies to both mobile and desktop play. To claim the bonus, make your first deposit in an amount of at least $50, and enter the promo code FIRST in the space provided when filling out your information. 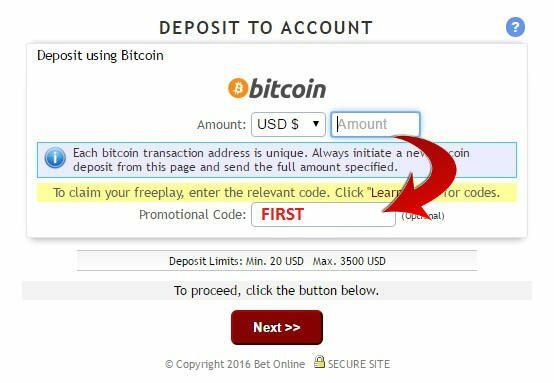 *NOTE – BetOnline.ag now supports deposits by Bitcoin – which is a great option for those who want the security and anonymity of using Bitcoin. There are no transaction fees when deposit via Bitcoin. If you do not have a Bitcoin account, we recommend opening an account at Coinbase, which simplifies the buying and selling of Bitcoin, and allows you to transfer funds directly to your bank account. Click here to visit Coinbase. As soon as your deposit clears, BetOnline will credit your account with a bonus amount worth 25% of your deposit. If you made the minimum $50 deposit, the bonus would be worth $12.50, and you’d have to deposit $4,000 in order to claim the maximum deposit amount of $1,000. The wagering requirement for this bonus is six times the deposit and the bonus. Therefore, if you claimed the minimum bonus, you’d have to wager $325 before you cleared the bonus and could withdraw any winnings. If you claimed the maximum bonus, you’d have to wager $30,000. Note that deposits made using Book-to-book don’t qualify for this promotion but will still count as your first deposit. This promotion is non-transferable, and you must use all bonus money before claiming any additional free bets or other promotions. This bonus money is good for the sportsbook only. You cannot use it for live betting or at the BetOnline racebook, casino or poker room. When claiming this bonus, you waive the right to make a withdrawal for 30 days after claiming the bonus money. Making a withdrawal prior to meeting the wagering requirements will void the bonus. In addition to the first deposit welcome bonus, BetOnline gives mobile customers a $50 RISK-FREE bet! Click here to sign up and get your free bet! This is how it works – place a real money bet via the mobile sportsbook. If your first mobile bet wins, then you win and you are not eligible for the free bet. However, if you lose your first bet, you will be refunded the amount of the bet, up to $50. So if you lose your first bet of $20, you will receive a free bet coupon worth $20. If your first bet was $100, you will receive the maximum free bet amount of $50. To receive your free bet, you must send an email to freeplay@BetOnline.ag, include your account number and the ticket number of your losing bet within 24 hours, and enter $50 Mobile Free Play as the subject of the email. After sending the email, you will receive your free play of up to $50 within 48 hours. The free play has a six-times (6x) rollover requirement before you may withdraw any winnings derived from the free play. Also, you cannot use this free bet on live betting. This is a fantastic offer and we encourage all players to take advantage of it! Although you can’t use the welcome bonus or the free mobile bet on live betting, BetOnline does offer a separate live betting promotion. Claiming it is simple: Place a live bet worth at least $25. If you lose the bet, contact BetOnline to request a refund. Provide your account number and the ticket number of the bet you want refunded. The subject line of the email you send should read “$25 Live free bet.” BetOnline will then credit your account with a $25 free play within 48 hours of sending that email! This promotion also has a six-times rollover requirement, which means that you’ll have to wager $150 to clear the bonus and be eligible for a withdrawal without voiding it. The free play isn’t limited to live betting and can be used on any wager at the sportsbook or racebook. Remember that you cannot claim additional free bets until you’ve played through current free bets. Therefore, if you’ve claimed the welcome bonus, you’ll want to play through your bonus money before placing your first live bet. As a BetOnline client, you’re also eligible for a 25-percent reload bonus for the life of your account. When you make your second deposit and any subsequent deposits, use the promo code LIFEBONUS. BetOnline will match your deposit by 25 percent up to $1,000. Wagering requirements and limitations are the same for reload bonuses as they are for the welcome bonus. One important difference is that reload bonuses expire after 90 days. If you have any unused reload bonus money after 90 days, it will void, and you’ll still be on the hook for the six-times rollover requirement for the full deposit amount and the portion of the reload bonus that you did use. The mobile-friendly site features a menu on the left-hand side that list all markets. The top of the list features major markets like baseball, football and soccer, and as you scroll down, you’ll get to markets like cricket, martial arts and even future and prop bets. Click on a sport and the site will bring up all events for that sport that will take place over the next 24 hours. Events are organized based on league. If you want to bet on college hockey, for instance, you’d press the arrow next to NHL to switch to NCAA. The site is loaded with features, and you can do everything you can on the desktop version, including making a deposit, managing your account details and contacting customer support, which is available 24/7. The site offers a powerful bet slip that you can access from the menu at any time, and it has advances tools for activities like searching your bet history. 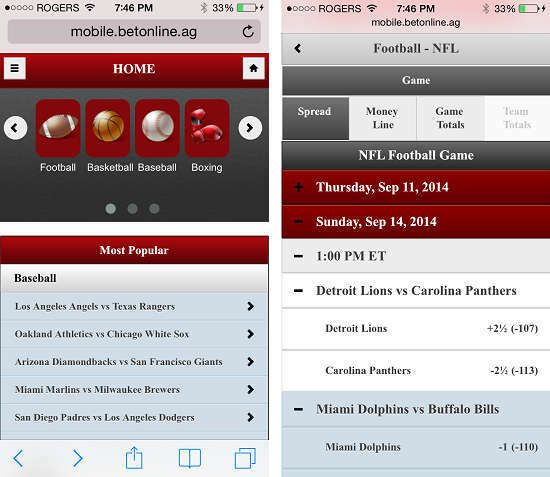 The BetOnline mobile website also supports live betting, which is wagering when a sporting event is already underway. To access this portion of the service, press the Live button in the horizontal menu at the top of the screen. This will bring up a list labeled Today’s Events, which has all of the matches that day for which BetOnline supports live betting. Pressing Live Odds in the black horizontal menu will bring you to all games that are currently underway. The Calendar feature lets you look ahead seven days, and the Multi-Event option lets you create a two-wager multiple bet. Press the My Wagers to see all active and recently settled live bets. BetOnline offers a granular level of live betting. If you’re betting baseball, for instance, you can actually place bets on a per-at-bat basis. BetOnline does not currently support cashing out early, so all live bets are seen to completion. Click here to open your mobile account at BetOnline.ag! You can read more about the BetOnline Sportsbook here. BetOnline also offers live dealer casino games! Learn more about the BetOnline Live Casino here. Ready to place some bets? Stay connected at BetOnline! Find all the latest BetOnline promo codes at USACasinoBonusCode.com. We also recommend Bovada Sports. Read our Bovada Sports mobile review here. Not only can you place sports bets on your cell phone, but did you know you can play live dealer casino games also? Check out the US friendly live dealer casino sites for reviews. The Black Diamond live casino offers live dealer mobile games! $50 risk free is legit! There is a $50 risk free deal when betting on your cellphone - you first place a bet and if you lose, you get refunded up to $50. If you win, you just win and don't get anything extra. So you should definitely place a bet of $50 on your phone because it's risk free. Either win it or lose it and get refunded for the loss with a free bet coupon! BetOnline is great and currently my preferred sportsbook for all my betting. I moved over from 5dimes and BetOnline's interface is way better - easier to use and faster.